From time to time, our ancestors, like other animals, would have come across fermented fruit or grain and would have sampled it with more than interesting results (see the video). Was grain first domesticated for bread or for beer? Since 1950, scholars have found evidence that Stone Age farmers were domesticating cereals not so much to fill their stomachs but to lighten their heads, by turning the grains into beer. Not surprisingly, the principal way to communicate with gods and ancestors has always involved an alcoholic beverage. In “Uncorking the Past“, Patrick McGovern argues that the perfect drink –whether it be mind-altering, medicinal, a religious symbol, a social lubricant, or artistic inspiration– has not only been a profound force in history, but may be fundamental to the human condition itself. The cereal staples of the modern world were probably domesticated for their potential in making quantities of alcoholic beverages, including rice wines of China and Japan, the corn beers of the Americas, and the millet and sorghum drinks of Africa. Jeffrey P. Kahn, the author of “Angst: Origins of Anxiety and Depression” and this article in New York Times thinks that the help of alcohol conversations around the camp-fire took on a new dimension: the painfully shy could now speak their minds. 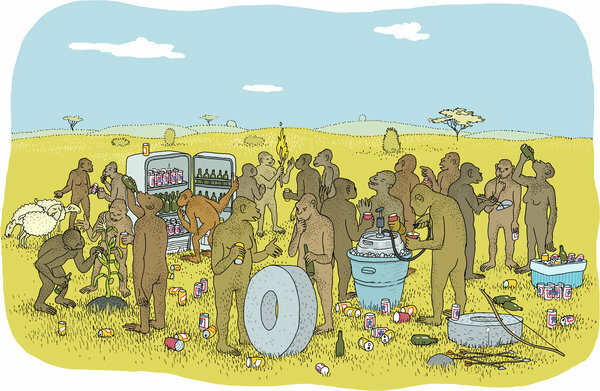 The alcohol would have had more far-ranging effects reducing the strong herd instincts to maintain a rigid social structure, allowing humans to become more expansive in their thinking, as well as more collaborative and creative. A night of modest tippling may have ushered in these feelings of freedom — though, the morning after, instincts to conform and submit would have kicked back in to restore the social order. Some evidence suggests that these early brews or wines were also considered aids in deliberation. In long ago Germany and Persia, collective decisions of state were made after a few warm ones, then double-checked when sober. Elsewhere, they did it the other way around.